Legend: Legacy of the Dragons is a free-to-play, award winning fantasy browser-based MMORPG (Massive Multiplayer Online Role-Playing Game) anyone can play without any extra installation hassle! Pick a side in an eternal battle between the Human race and the nation of Magmars in the world of Faeo. Customize your character with powerful weapons and armor sets depending on your class. There are hundreds of epic quests, unique locations and vivid characters, vast dungeons filled with thousands of collectible items and useful resources to gather. Form a clan or a party and experience awesome boss battles, engage in massive 500 vs 500 Player versus Player clash events brought to you via a fully animated asynchronous dynamic combat system. Tame your own Tiger or Zorb and summon it as a personal guard. Hone your skills and become a renowned master of the profession of your choice. 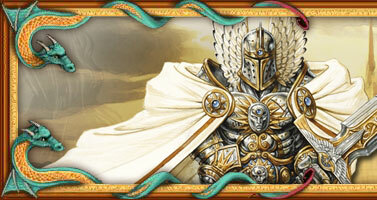 Learn battle magic spells and deadly combos to stun or vaporize your enemies. Master the lore of the Dragons and become a Legend! Legend’s asynchronous dynamic combat system is simple to learn, yet tricky to master. Each battle in Legend is a real-time battle where the player makes each strike himself. The battle interface is intuitive to any player and includes a large number of moves, combos and battle options for every character, depending on their class, equipment and a whole host of other variables. Block, dodge, evade, cast powerful spells, heal, summon your pet or some nasty creatures - the choice is yours. Each combat sequence is fully animated and you can see all the results of your attacks, spells and summons immediately. Legend offers you the chance to take a real and active part in a battle and to watch every move of your character on the screen without being bogged down in the flood of information that is usual for other browser games. All the equipment you put onto your character is shown to all the players in both “Character Information” screen and in battles as well, so every little detail counts! One look at your opponent will tell you whether you are fighting a man, a Magmar or a mouse! In addition, if you feel weak at any point during the battle, call your friends to join your battle and end up in a massive skirmish with hundreds of participants. What's more important, this is a game where the results do not depend on luck, but on YOU making the right decision. Duel: One-on-one combat. Issue a challenge indicating the level of the desired opponent, set the timeout and wait for someone to accept. Review the challenge and start the battle. Group battle: Build a team, announce your challenge to the rivals and wait for the battle to commence. Melee: Once you have accepted a challenge to a melee, you will be placed on a list with all the other challengers. The list will then be automatically divided into two teams and the fighting will begin. And many more, including variety of battlefields! No doubt you can't wait to engage the warriors of the opposing nation in combat! From the moment you leave your home city there will be thousands of battles ahead of you. Find the enemies of your people before they find you and prove your strength in combat. With the exception of the main cities, which are well protected, you are free to attack the warriors of the other race virtually anywhere. (Copper coins): The smallest denomination in the game. (Silver coins): The second most valuable game denomination. 1 = 100. (Gold coins): The most valuable denomination. 1 = 100. Unlike many other games, ALL the coins can be obtained during the battles and quests, thus the game is FREE TO PLAY as you could earn money for all the items yourself!